CANCELLED! April brings golden showers in Oakland! UPDATE: We’ve got a broken bone (no, not that one you jerk) so we’re cancelling this April show. Stay tuned for a special June return with a one-time appearance with Hurricane Markley! We’ll be spending the rest of April and all of May trying to get the piss out of our rubber sheets, so this is our last show until summer time! Come party with us in the East Bay (“Pig Latin for Beast!”) at the Night Light! 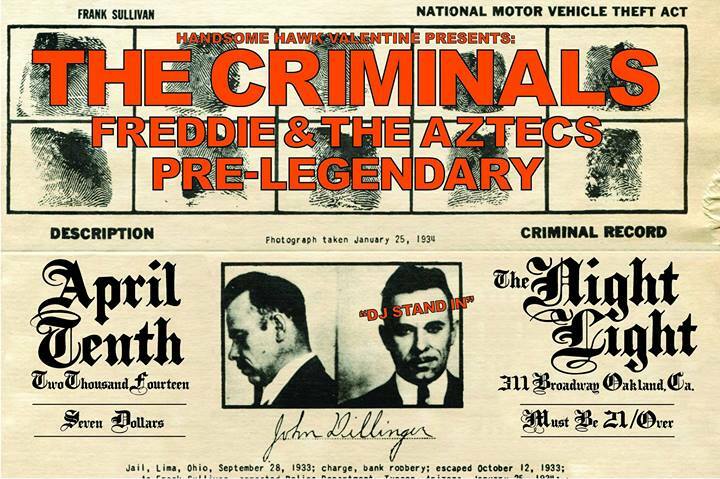 FREDDIE & THE AZTECS features folks from NUISANCE, PEECHEES, and half a dozen others. PRE-LEGENDARY features folks from JOHN HENRY WEST, SALEM LIGHTS, VETIVER, PAPERCUTS, and half a dozen others. Not only will there be 3 bands for you to rock out to, there’ll be DJ Stand-In, who’s been banging his head against the garage and the punk rocks since you were in short pants! $7, 21+, not wheelchair accessible, sorry! Notes: CANCELLED! 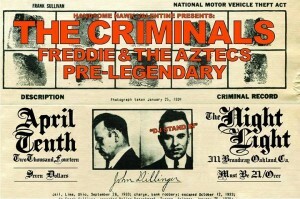 with Freddie & The Aztecs and Pre-Legendary! Not wheelchair accessible.